Hugh Hopper died on June 7, 2009 from leukemia. According to a google search, one of the symptoms of the disease can be a feeling of fatigue, which makes me wonder if the doctors got his diagnosis right, because if The Gift of Purpose’ is any indicator he was far from fatigued nearing the end of his life. Hopper left behind quite a legacy. He is undoubtedly best known for his bass work in the groundbreaking and hugely influential Soft Machine, but he had an illustrious career beyond Soft Machine as well. A listing of his solo work and collaborations with others over the last 30 years would fill this blog, but a good place to start investigating would be Hopper’s own website. Which brings us to ‘The Gift of Purpose,’ recently released on Cuneiform Records. 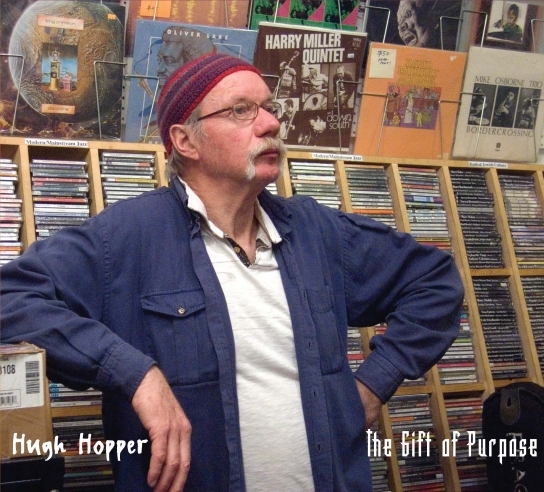 Though ‘The Gift of Purpose’ is billed under Hopper’s name, this is definitely a Bone CD. Bone was Nick Didkovsky (guitar), Hopper (bass) and John Roulat (drums) and this recording dates from a Feb. 16, 2008 performance at Orion Sound Studios in Baltimore, Maryland. The band is soaring and searing for the most part. Didkovsky, always bionic, and perhaps best known from his bionic band Dr. Nerve, is…well…bionic here as well. There’s lots of screaming lead guitar played over Hopper and Roulat’s improvised bedrock. Which brings us again to the gift of purpose. All of the monies collected from sales of this CD are going to benefit the Hopper family, who are bearing a financial burden, as well as emotional stress, following Hugh’s passing. Steven Feigenbaum of Cuneiform Records and Nick Didkovsky paid for the manufacturing costs of the CD from their own pockets. If you buy this CD direct from Cuneiform / Wayside Music, or from Downtown Music Gallery (in NYC), you can be assured that every cent goes to Hugh’s widow, Christine. So, not only do you get a superb set of music from a bone-crunching progressive power trio, you can give something back in return to a musician who has contributed to the listening pleasures of anyone who has ever listened to progressive rock. Hyperbole? Just imagine what this part of the musical spectrum might sound like today if there had been no Hugh Hopper. In the liner notes of the CD, we find this suggestion: ‘Listen to this record extremely loud and in one sitting. Open your windows so your neighbors can hear it too.’ Sounds like a good start. You are currently browsing the archives for the Hugh Hopper category.